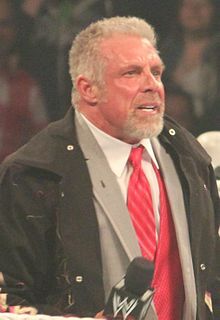 ↑ 1.0 1.1 1.2 1.3 1.4 1.5 1.6 "Ultimate Warrior's OWoW Profile". Online World of Wrestling. สืบค้นเมื่อ January 4, 2008. ↑ 2.0 2.1 2.2 "Ultimate Warrior". WWE.com. สืบค้นเมื่อ April 11, 2014. ↑ "Ultimate Warrior passes away". WWE. ↑ "Warrior news: Report – Ultimate Warrior initial Cause of Death". Pro Wrestling Torch. สืบค้นเมื่อ April 9, 2014. ↑ "WARRIOR NEWS: Report – Warrior appeared to be "very sick" prior to death, Hall of Fame special includes Warrior message, Jim Ross blogs on Warrior's legacy". Pro Wrestling Torch. สืบค้นเมื่อ April 9, 2014. ↑ "NWE World Heavyweight Title History". cagematch.net. สืบค้นเมื่อ July 11, 2008. ↑ "Pro Wrestling Illustrated (PWI) 500 for 1992". The Internet Wrestling Database. สืบค้นเมื่อ February 11, 2015. ↑ "Pro Wrestling Illustrated's Top 500 Wrestlers of the PWI Years". Wrestling Information Archive. สืบค้นเมื่อ September 15, 2010. ↑ "The Ultimate Warrior's first WWF Championship reign". ↑ "The Ultimate Warrior's first Intercontinental Championship reign". ↑ "The Ultimate Warrior's second Intercontinental Championship reign". ↑ 16.0 16.1 16.2 16.3 16.4 16.5 16.6 16.7 Meltzer, Dave (January 27, 2014). "Jan 27 2014 Wrestling Observer Newsletter: 2013 Annual awards issue, best in the world in numerous categories, plus all the news in pro-wrestling and MMA over the past week and more". Wrestling Observer Newsletter. Campbell, California: 18–33. ISSN 1083-9593. หน้านี้แก้ไขล่าสุดเมื่อวันที่ 20 กรกฎาคม 2561 เวลา 20:58 น.